Once a player has selected a sportsbook, the next consideration should be which deposit method to choose. Most books now accept a wide range of deposit methods, including credit cards, bank wire transfers, and e-wallet payments. While any of these methods may deliver funds to your account, not all options are exactly the same. 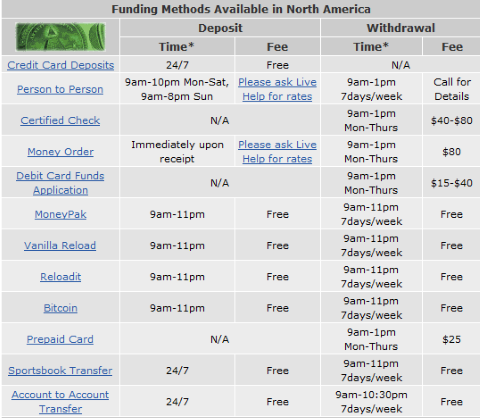 Fees, waiting periods, minimums, and even withdrawals can be impacted by the deposit method which is chosen. First we’ll consider minimum deposit requirements, as these can vary greatly among deposit methods. The lowest minimums typically come with e-wallet payment methods such as Skrill, Neteller, and PayPal. Sportsbooks do have to pay fees for accepting these types of payments, but those costs tend to be lower than those associated with accepting other methods. Credit card minimums are a tad higher, but not at all unreasonable. It will be methods such as money orders, bank wire transfers, and checks that will be linked to the highest minimum requirements. The speed of payment should also be a consideration. When a player is ready to start betting, he or she will likely wish to do so immediately. To make this happen, the payment needs to be credited to the players account right away. Credit card and e-wallet payments will always be the fasted to credit, while wire transfers, checks, and money orders will be the slowest. If you are not in a rush to get started, these slower methods are fine, but if you wish to jump right into the interface and start betting online, there are faster options. Some sportsbooks do charge fees on deposits, while others do not. Those that do, do so for the purpose of helping to recover the fees that they incur for accepting payment. The truth of the matter is that any book that is charging fees on most deposit methods is not likely to be a solid selection. Major books earn enough money to cover these costs and not pass them along to the players. With that being said, even some of the largest online books do charge withdrawal fees on select payment methods. This is common practice and not necessarily any reason for concern. Dependent upon rules and regulations, some companies may issue withdrawal funds in certain manners in accordance with the method of deposit that was used. For example, if a player deposited $200 by using their Visa card and then won $200 in bets, only the original $200 would be credited back to the credit card, while the remaining $200 would need to be withdrawn using a different method (typically wire transfers). Each sportsbook is likely to have their own rules in place, so players are advised to learn what these are prior to submitting a deposit. A final deposit consideration is the location of the player. At times, books are only able to select certain payment types from individuals who reside in specific locations. Players who live in the United States often find it easiest to deposit via credit card or bank wire transfer, while others may find it easier to submit an e-wallet payment. Credit card payments are not without complication, as credit card companies are constantly monitoring for fraud. It may be necessary to contact your credit card company directly to inform them that an overseas transaction is about to take place so that the transaction will not be blocked. Each payment method may be better or worse than another, depending upon the sportsbook that is chosen. Should there be any questions about fees, processing time-frames, or any other matter, contact customer service. Any representative should be able to quickly tell you which deposit method is best.